You know those mornings when you wake up, look in the mirror and you're glowing? That's the feeling I want you to have in one of our unique wedding dresses in Los Angeles. Naturally breathtaking and beautiful, my designs are simple and elegant—it's your body that gives them life. Your designer wedding gown will be cut to enhance your best features, and you will look like the beautiful woman you are. Step 1: Forty-five years of designing and making dresses for all shapes and sizes is my life's work. Call or email me about your wedding and make an appointment to visit my studio/salon. Step 2: Your appointment is all set. Come meet with Hanna to talk about your wedding plans. Step 3: You will be shown all of the gowns from the collection and Hanna will explain the fabrics and design features to create your vision. Step 4: You try on samples and the customizing of your gown begins! 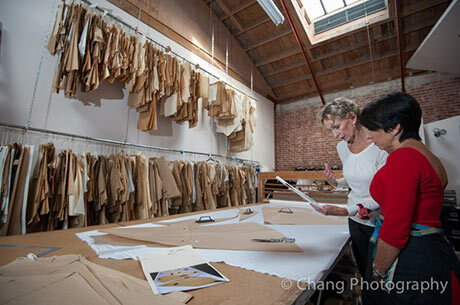 Step 5: Detailed notes of your gown are taken to the design/workroom, and we make your custom pattern. Step 6: A dress form is built to your exact measurements and fittings are made here...when you have your own fitting, you will see your nearly complete gown and final tweaks are made. Time efficient for the busy bride! Step 7: The fitting of your actual dress...just the final adjustments needed. Step 8: Hanna! Thank you so much for the beautiful dress! !